October's over already - how crazy is that? It's now November which means December and Christmas is just around the corner! Have you done any of your Christmas shopping already? Let me know in the comments. 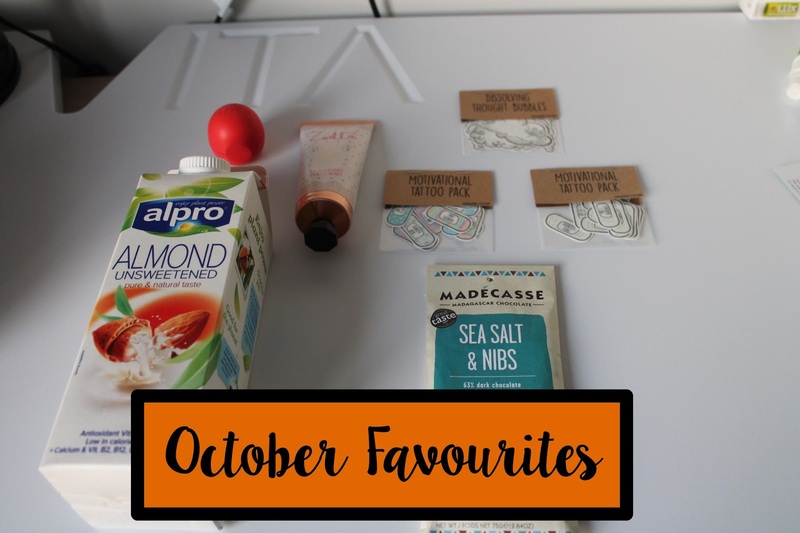 Without further ado, here are the things I've been loving in the month of October. It's the start of winter so that means my hands (along with many others) become quite dry. I've always been a fan of hand creams and seeing that Zoella had brought one out as part of her Zoella Beauty range, I had to go and get a tube of it. The packaging is so cute and smells of the original collection scent, so it was a winner in my books. I used it every day and even though the tube isn't small enough to fit in a small bag or is necessarily travel size (which I would have liked), it looks great on my shelf of perfumes/cosmetics. These lip balms have been available in the US for a while and I've always wanted one. So when I saw them at the till in Boots (much to my surprise), I picked a couple up. The good thing about these lip balms (as you can see) is that they're in a spherical shape, so don't need to be twisted to apply: just open the cap and go. It stays on for a long time and saves dry lips, which mine are most of the time - so it's a lifesaver, as well as being perfect for your handbag and travelling. I've been trying to change my lifestyle recently (with varying degrees of success) and love a bit of almond milk with my porridge or in smoothies - it's so much better than normal milk as it brings some flavour, with also being a vegan and plant-based option, something I try to incorporate as often as possible. Everyone loves chocolate and I'm no exception. I've been looking for different alternatives to Dairy Milk as it's full of sugar and other rubbish, so I saw this (actually I saw the packaging and thought it was so cute) in Whole Foods in London (my haven whenever I'm in the city) and decided I had to have it. It's a dark chocolate bar and contains cacao nibs - one of the healthiest superfoods out there, full of antioxidants and tastes great in the bar. If you're looking for a different kind of chocolate to your usual Cadbury, this is a good choice to make. I was on a late-night peruse through Etsy to see what I could find, and stumbled upon these. I was intrigued by them and had to buy some. For anyone going through a hard time or needs a little boost of self-care, these tattoos (or the whole Etsy shop to be honest) is for you. The tattoos are temporary and have different inspirational quotes on them, such as "better every day" and "I am enough", little things to make you feel better when you're at a low. I'm modelling the "creativity" one here on my arm, reminding me that I am a creative human.